There was little to cheer for English cricket supporters in 1993 when an Ashes series that started with low expectations proved to be even more dismal than anyone feared. But for one afternoon at the start of August, four days after the men's captain, Graham Gooch, had fallen on his sword, all seemed right with the world as England's women won the World Cup at the home of cricket. The setting of Lord's was hardly fitting, given that women had only been allowed to play there - and then only on one other occasion - since 1976, and they were still not allowed in the pavilion or to be members of the MCC. But for that afternoon, chauvinism was put to one side and all that mattered was the cricket. The two-week tournament almost didn't happen. Days before the scheduled start, the necessary funding was not in place, and only a late £90,000 grant from the Foundation for Sport and Arts and some high-profile individual gifts meant it was able to go ahead. The finances meant that the competition was limited to the home counties, although unlike previous events there was the advantage of being able to play on some county grounds. There were still problems. At Ealing, where England beat Netherlands three days before the final, the players were left to roll the pitch, described by captain Karen Smithies as "an absolute disgrace", and sort out the covers themselves. Despite the media completely ignoring the whole event, the final did rouse the national consciousness. For one thing, it was the first time that it had not been between England and Australia. For another, New Zealand, unbeaten and in awesome form, had already beaten England in the qualifying stage. Ruth Prideaux, England's coach, certainly preferred playing New Zealand, despite their form, admitting that the atmosphere during the victory over Australia had been "not pleasant". For the day itself MCC, who helped underwrite the tournament, underestimated its attraction and only opened the Grandstand side of the ground. That actually helped create an electric atmosphere as more than 5000, the ground's biggest paying attendance of the year for a match not involving Australia, packed into one small area. The contrast between the vibrant Grandstand and the jacket-and-tie stuffiness had rarely been more stark. Even the BBC rehashed their schedules to include coverage in their Sunday-afternoon sports programme, Grandstand. Bookmakers Corals said that England were slight favourites "on their home ground". The irony of Lord's being considered home to women's cricket was not lost on the players. The occasion did appear to get to the hitherto unflappable New Zealanders. Although Sarah Illingworth won the toss and stuck England in, from then on almost nothing went right for them. 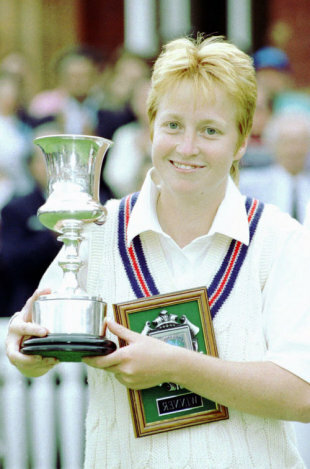 Sarah Potter, a former England vice-captain who played at Lord's in 1987, wrote in the Times the next day: "When a young woman cricketer pushes open the little white gate to step on to the pitch at Lord's, something spidery crawls up the lining of her throat… the sight of all the nervously flushed faces and twitching limbs brought it all back. There they were again, spilling down the steps in their white skirts, fulfilling the impossible dream." Janette Brittin, who in the course of her 48 became the first woman to score 1000 World Cup runs, recalled the moment she walked out to bat. "Never before have I gone out… with tears in my eyes, caused by the wonderful ovation from the members who lined our path through the Long Room, followed by the crowd's reception as we walked out to the middle." New Zealand dropped four catches, including, crucially, Jo Chamberlain when she had made 7. Brittin and Carol Hodges, in her final match, added 85 for the second wicket, and then Chamberlain, a van driver from Leicester, bludgeoned an unbeaten 57 from 53 balls for the fifth wicket with Barbara Daniels. Chamberlain fell for 38, aiming a massive slog towards the Tavern, and as she walked backwards towards the pavilion, shook her fist to encourage her partner to press on. "Even the normally reserved elderly gents massed in the members' stand stood to show their approval," Potter recalled. England finished on 195 for 5 from their 60 overs, the last 12 producing 81. New Zealand had not had to chase more than 96 in any of their previous matches. New Zealand started solidly but then, again, it all seemed to get too much for them. Chamberlain came into the attack and immediately had Kirsty Bond brilliantly caught by Suzy Kitson at gully, and to underline the sense she could do no wrong, then scored a direct hit from cover to run out Debbie Hockley, New Zealand's leading batsman and the scorer of their only fifty of the fortnight. Chamberlain then caught Emily Drumm for a fourth-ball duck, completing a wretched day for the New Zealander, who had earlier been responsible for two of the drops. From 51 for 1 they slid to 71 for 5 with more than half their overs gone and the celebrations in the Grandstand started. "With the game already beyond reach and nothing to lose, Catherine Campbell, the Kiwis' last batsman, hit hard and high to deep midwicket," wrote Mike Selvey in the Guardian. "Brittin was lurking. As the ball steepled away towards the Grandstand, she dashed to her left and took the catch as it came over her right shoulder: dropping it was never an issue. Up went her arms - the ball was last seen heading aerially towards Swiss Cottage - and she stampeded off into the arms of the awaiting supporters who had already streamed out of the stand and flooded on to the pitch." Smithies lifted the trophy, and even if it was for one day only, women's cricket made all the newspapers, the front pages of a few, and even the main BBC evening news. Admitting that the team had received a good-luck message from the men's side in the morning, Smithies couldn't resist a jibe. "Perhaps they could learn a few things from this," she said. "We hope it might show the way for them with our fielding and our bowling, which was tight and accurate." But amid all the celebrations, there was a feeling that things had to change. The Women's Cricket Association hierarchy was, as one critic noted, out of "the Mallory Towers era". In the Times, Alan Lee wrote: "[the final] illustrated the athleticism of the game and the status to which it can aspire; what is needed now is firmer and more enterprising administration". Perhaps the most damning comment came from Potter, speaking from her first-hand experience. "Progress has been held back by lack of hard cash and column inches, and buckets of male condescension. The sport in England staggers along in unnoticed crisis. Tours teeter on the edge of humiliating cancellation; players selected for their country are expected to have deep pockets, sympathetic employers, squeaky-clean shoes and an inordinate patience about the sweet old dears who mostly run the game." Is there an incident from the past you would like to know more about? E-mail rewind@cricinfo.com with your comments and suggestions. The Cricket Monthly And the World Cup goes to… England!